Thinly slice the fennel stalks. Finely chop enough of the fronds to make 3 tablespoons. In a shallow dish, combine the stalks, wine, garlic, lemon zest and red pepper. Add the lamb chops and turn to coat. Let stand at room temperature for 1 hour, turning the chops once halfway through. Pat the lamb chops dry. Strain 1/2 cup of the marinade and reserve. In a very large skillet, heat 2 tablespoons of oil. Season the chops with salt and pepper, add them to the skillet and cook over moderately high heat until browned, 4 minutes. Turn the chops, reduce the heat to moderate and cook until medium-rare, 4 minutes; transfer to a plate and let rest. Pour off the fat in the skillet. Add the reserved 1/2 cup of marinade and boil over high heat, scraping up the browned bits from the bottom of the skillet, until reduced by half, about 2 minutes. Add the chicken stock and boil until reduced to 1/4 cup, about 4 minutes. Reduce the heat to low and stir in the crème fraîche. Remove the skillet from the heat. Add 1 tablespoon of the chopped fennel fronds and season with salt. In a bowl, toss the sliced fennel bulb with the lemon juice, and the remaining 2 tablespoons each of the oil and fronds. Season with salt and pepper. 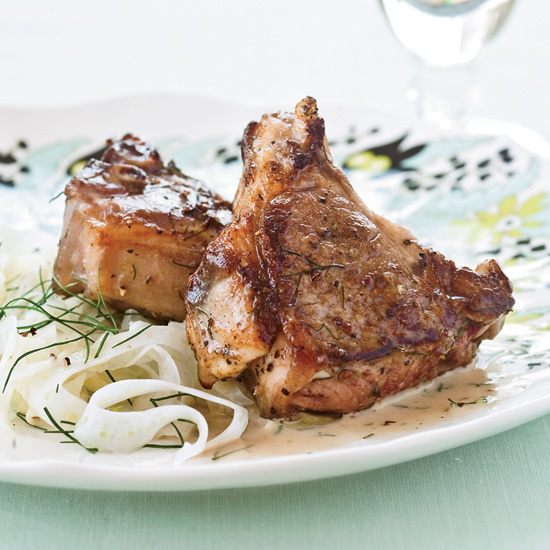 Transfer the salad to plates and top with the chops. Spoon the sauce over the chops and serve. The lamb chops go well with a Rhône-style white.